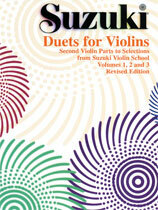 This book contains the second violin part and some third violin parts written by Dr. Suzuki to selected pieces from Suzuki Violin School, Volumes 1, 2, and 3. When a student starts playing advanced pieces he may learn the second part. Contents are: Lightly Row (Folk Song) * Song of the Wind (Folk Song) * Go Tell Aunt Rhody (Folk Song) * O Come, Little Children (Folk Song) * May Song (Folk Song) * Long, Long Ago (T.H. Bayly) * Allegro (Shinichi Suzuki) * Perpetual Motion (Shinichi Suzuki) * Allegretto (Shinichi Suzuki) * Andantino (Shinichi Suzuki) * Etude (Shinichi Suzuki) * Minuet No. 1, Minuet III from Suite in G Minor for Klavier, BWV 822 (J.S. Bach) * Minuet No. 2, Minuet, BWV Anh. II 116 from Notebook for Anna Magdalena Bach (J.S. Bach) * Chorus from Judas Maccabaeus (G.F. Handel) * Mussette, Gavotte II or the Musette from English Suite III in G Minor for Klavier, BWV 808 (J.S. Bach) * Bourree from Sonata in F Major for Oboe, HHA IV/18, No. 8 (G.F. Handel) * Gavotte (P. Martini) * Minuet, BWV Anh. II 114/Anh. III 183/Anh. (J.S. Bach) * Minuet in G, Wo0 10, No. 2 (L. van Beethoven). This title is available in SmartMusic.